As UN Admits Abyei Medevac Delay Was For Copter from Wau in South Sudan, What Safeguards Are In Place? UNITED NATIONS, August 5,updated -- As the delay associated with the death of three peacekeepers in Abyei garners more interest, the UN on Friday afternoon reversed its position of hours earlier, and admitted that it asked Sudan if it could medevac the injured peacekeepers using a helicopter from Wau in South Sudan, and that Sudan said no, "that is a different country." This is what UK Permanent Representative Mark Lyall Grant told Inner City Press on Thursday evening, but which Secretary General Ban Ki-moon's spokesman Martin Nesirky denied Friday at noon, saying that the request had been to fly the helicopter from Kadugli in Sudan. If Khartoum blocked a medical flight entirely within Sudan it would be one thing; for them to deny access to a helicopter from a country which just broken away, while heartless, is not unexpected. So the question is, why did the UN not plan for it, not admit it when it happened, and try to dissemble about it even after the cat was out of the bag, due to the UK Ambassador's commendable candor? And what ensures that if a UN peacekeeper is injured today in Abyei, they too might not bleed out due to a lack of planning? Watch this site. Note: The Council meetings on August 11 about Sudan -- but outgoing DPKO chief Alain Le Roy's last day is August 10. So once again at the UN: no accountability? Footnote: Earlier this year when the Security Council traveled to Sudan, they intended to go to Abyei. But even before fighting flared up, there was controversy about whether they would fly in via Wau in the South, which has a shorter runway, or Kadugli, where ICC-indicted Southern Kordofan government Ahmed Haroun might greet them on the tarmac. Ultimately they didn't go: but they were on notice of the problems of air travel to and from Abyei. We will continue on this. Matthew: You asked yesterday about the US position on the Sudanese response to the tragic incident in Abyei. Below is a statement from Secretary Clinton which was just released. The United States is deeply concerned by the deaths of four United Nations peacekeepers whose vehicles struck and detonated a land mine in the Abyei region this week, and by the Government of Sudan’s response to this incident. We offer our deepest condolences to the families of the fallen, to the people of Ethiopia and to the United Nations. We are alarmed by reports that the Government of Sudan delayed granting the necessary flight clearances to allow the expeditious medical evacuation of the injured peacekeepers and threatened to shoot down any UN helicopter that attempted to access the area without approval. Three wounded soldiers died during this unnecessary delay. 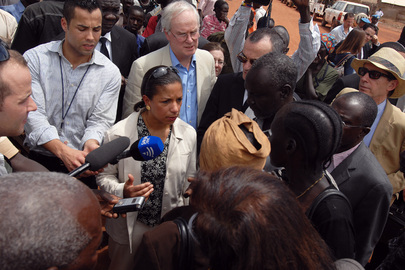 The United States is committed to ensuring that the United Nations Interim Security Force for Abyei (UNISFA) has the political support to carry out its important and difficult mandate under challenging circumstances and strongly condemns the Government of Sudan’s non-compliance with its obligation and its obstruction of the work of the United Nations. This tragic incident also underscores the importance of establishing peace and security in Abyei, and between Sudan and South Sudan. We urge the Governments of Sudan and South Sudan to fulfill their agreement to withdraw their forces immediately from the Abyei area, and to allow full and unrestricted access to UNISFA personnel. The statement does not mention that the UN helicopter was asked to come from Wau in South Sudan, nor that UN peacekeepers were sent into Abyei without a Status of Forces Agreement (or human rights monitors). Meanwhile at the UN on Friday featuring the Bishop of Kadugli, the doubt that State Department official and envoy Princeton Lyman has cast on satellite images depicting mass graves in Southern Korofan was criticized. But the above has come in. We will continue to report. UNITED NATIONS, August 5, updated with UN reversal here -- The UN's lack of transparency about the delay of medevac helicopter transport from Abyei of three peacekeepers who died after a landmine explosion grew worse on Friday, highlighting the UN's lack of planning for the UNISFA peacekeeping mission of Ethiopian soldiers it is paying from in Abyei. On August 4, after outgoing chief UN peacekeeper Alain Le Roy answered Inner City Press that the Sudanese government "prevented us to take off... by threatening to shoot at the helicopter." Video here, from Minute 46:56. Audio here, from Minute 46:53. Le Roy said that while the UN had yet to sign a Status of Forces Agreement or SOFA with the Khartoum government for the UNISFA mission in Abyei, the old SOFA of the expired UN Mission in Sudan was still in place. But later on August 4, UK Permanent Representative to the UN Mark Lyall Grant told Inner City Press that "the UN asked for permission for helicopter to come from Wau to pick up the injured. The Sudanese government said they couldn't come from Wau because that was a different country. So they said can we bring a helicopter from Kadugli. It took about three hours or so to get that permission, by the time they picked them up and took them back, it was too late." On August 5 Inner City Press asked Secretary General Ban Ki-moon's spokesman Martin Nesirky to confirm or deny that the UN has asked to fly a medevac helicopter from Wau and had been denied. Nesirky in essence denied it, saying "the helicopter was to come from Kadugli to bring the wounded peacekeepers to Kadugli." The difference is important: if the possibility of needing to bring a helicopter from Wau, since July 9 in the independence nation of South Sudan, had not been thought out by the UN, it would in many views be negligence. The reported actions of Sudan are outrageous -- but not unforseeable. So it is responsible for the UN to put peacekeepers into Abyei without having an agreed plan to get them out for medical treatment if needed? Was it a helicopter from Kadugli to Abyei, both in Sudan, that Khartoum "threatened to shoot down," as Le Roy put it? Nesirky would not repeat the shooting threat statement, rather saying that that "could not take off because there was a long delay" in getting permission. But if as Le Roy told Inner City Press on August 4 the old UNMIS Status of Forces Agreement is still in place, why would permission have been needed to fly within Sudan for medical purposes? Nesirky himself went on to say "it is standard procedure that medevacs do not require clearance." Why did the UN wait for clearance if it was only asking to fly within Sudan, and not from South Sudan? Is there a SOFA in place? What ensures that the same thing can't happen today, or tomorrow? Watch this site.